Sandro Botticelli, "Virgin and Child with Angel" (c. 1475), Chicago Institute of Art, Christmas stamp 1981. Larger image. Andrea Mantegna. Madonna with Sleeping Child. (c. 1465-70), Oil on canvas. 43x32 cm. Gemäldegalerie, Berlin, Germany. Raphael, The Alba Modonna (1510), oil on panel transferred to canvas, diameter 94.5. National Gallery of Art, Washington D.C. Round, beautiful Madonna with Jesus in her lap, and John the Baptist in animal skins looking up at him. Madonna and Child, Die Gemäldegalerie Dresden. Foran dette bildet sitter Ibsens kunstnerinne hensunket i. Another. Madonna and Child. Oil on canvas. Palazzo Pitti, Galleria Palatina, Florence, Italy. Another. Madonna del Rosario (1650-1655), Museo del Prado. Another. Adolphe Jourdan (1825-89), Madonna and Child, Smith Art Gallery and Museum, Stirling, Scotland. Another. 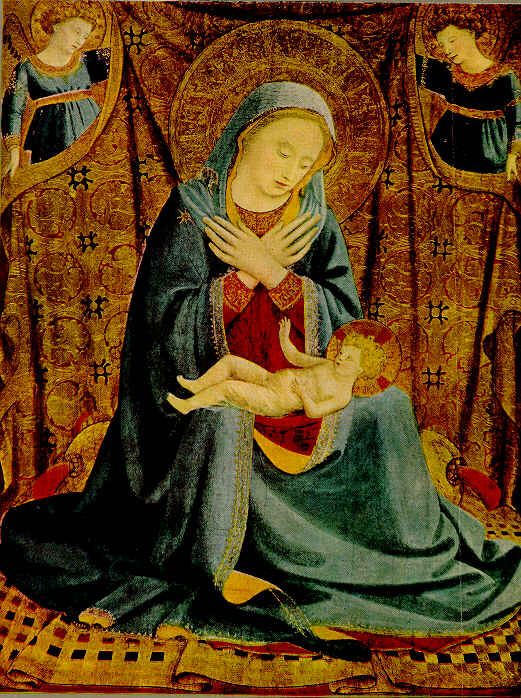 Madonna and Child (c. 1470), tempera on panel, 74.5 x 54.5 cm, National Gallery of Art. Christmas stamp 1983. Virgin and Child with Angel (Small Madonna) (1475-1485), Tempera on panel, Institute of Art, Chicago. Christmas stamp 1981. Adolphe-William Bouguereau (French artist, 1825-1905), "Virgin and Child" (1888), oil on canvas, 176.5x103 cm, Art Gallery of South Australia, Adelaide. "Virgin and Child" (La Vierge Au Lys, 1888), oil on canvas, 176.5x103 cm, Art Gallery of South Australia, Adelaide. Virgin seated holding naked Christ child with arms spread, both with golden halos. Song of the Angels" (La Vierge aux Anges, 1881), oil on canvas, 84x60", Museum at Forest Lawn Memorial Park, Glendale, CA. Shows angels serenading the Mother and Child. Another. 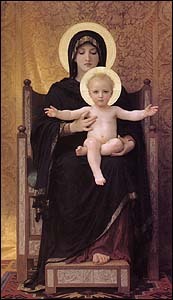 L'innocence (1893), of the Madonna cradling both the Christ-child and a lamb, signifying his role from birth as the Lamb of God who takes away the sins of the world. The Holy Family. Mary (spinning) with John the Baptist, and Jesus. Song of the Angels (1881). Forest Lawn Cemetery, Glendale, California. Angels serenading the Christ child and mother. Frantisek Tkadlik, The Virgin and Child with Distaff, (1822), Prague. Henry Ossawa Tanner, Mary (1900), oil on canvas, LaSalle University Art Museum, Philadelphia. Mary looking at newborn son, concealed under a blanket. Louis S. Glanzman (1922- ), Mary, the Mother of God and Mary in Women of the Bible series. Mixed medium on artboard. Morgan Weistling (California illustrator and painter, 1964- ), "Kissing the Face of God" (1998). Mary holding the baby Jesus, kissing him on the cheek. Amazing image of mother-love. The Black Madonna of Częstochowa or Our Lady of Częstochowa (Czarna Madonna or Matka Boska Częstochowska in Polish, Imago thaumaturga Beatae Virginis Mariae Immaculatae Conceptae, in Claro Monte in Latin, Ченстоховская икона Божией Матери in Church Slavonic), Poland's holiest relic, one of the country's national symbols. It is attributed to St. Luke, who is reputed to have painted it on a cypress table top from the house of the Holy Family. 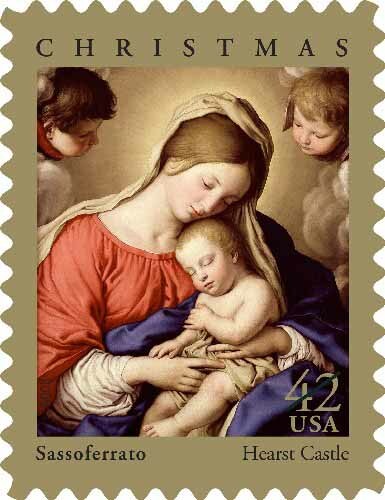 Most of the traditional Christmas stamps since 1965 include a Madonna and Child painting found in a US museum, but most are by Old World masters. 2016-17. Nativity, designed by Greg Breeding, with original art by Nancy Stahl. 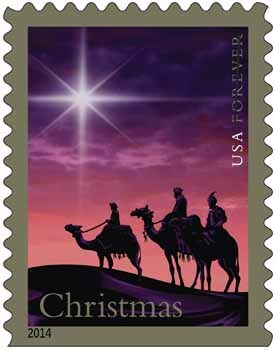 2014, Christmas Magi Stamp, designed by Greg Breeding. 2013. Jan Gossaert, "Virgin and Child" (1531), Cleveland Museum. 2011-12. Raphael, "Madonna of the Candelabra" (1513), tondo (circular painting), oil on panel, Walters Art Museum, Baltimore. 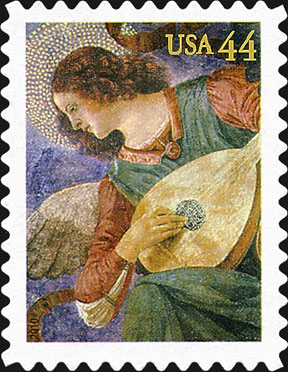 2010, Angel with Lute stamp, designated a special stamp, not an official Christmas stamp. 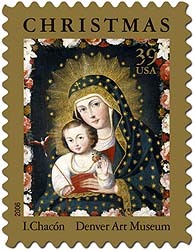 The 2009 Christmas stamp will be used again in 2010. 2009-2010. Giovanni Battista Salvi (1609-1685), also known as Sassoferatto, "Madonna and Sleeping Child," Hearst Castle, California. 2008. 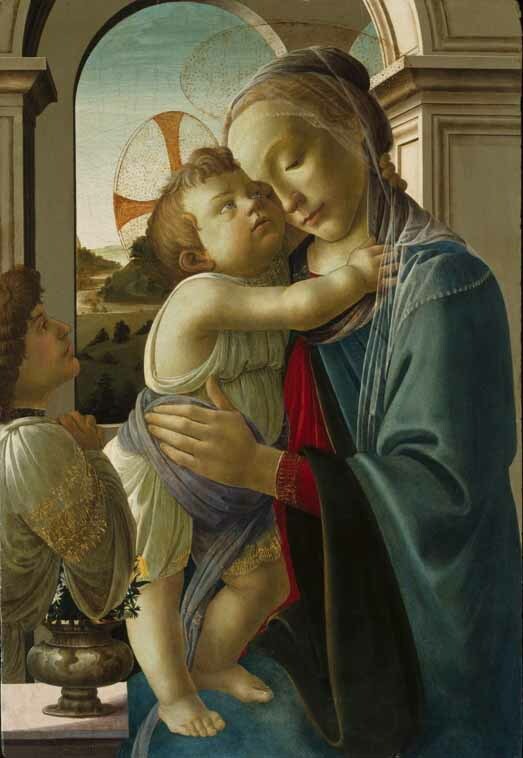 Workshop of Sandro Botticelli, "Virgin and Child with the Young John the Baptist'' (c. 1490), Cleveland Museum of Art. Round painting. 2007. Bernardino Luini (1470-1530), "Madonna of the Carnation (1515), National Gallery of Art, Washington DC. Larger. 2006. Ignatio Chacón (Peruvian artist active 1745-1775), Madonna and Child with Bird (1765), Denver Art Museum. 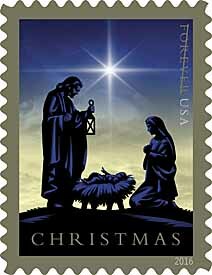 Traditional Christmas stamp 2006 for the US Postal Service. 2005. Bernardino Luini (c. 1480-1532) , The Madonna of the Carnation (c. 1515), National Gallery of Art. Christmas stamp 2005. 2004. Lorenzo Monaco (c. 1370-1425), "Madonna and Child" (), National Gallery of Art. Christmas stamp 2004. 2002, 2003. 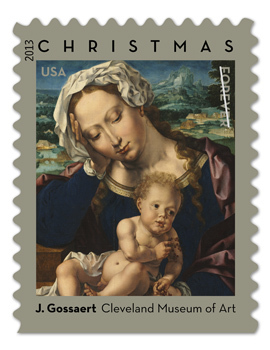 Jan Gossaert (c. 1478-1533/36), Madonna and Child (c. 1520), Art Institute of Chicago, Christmas stamp 2002. 2001. Lorenzo Costa (1460-1535), "Virgin and Child" (detail, c. 1490), Philadelphia Museum of Art. Christmas stamp 2001. 1999. Bartolomeo Vivarini (1432-1499), Madonna and Child. Christmas stamp 1999. 1998. Florentine (15th century), Madonna and Child. Christmas stamp 1998. 1997. Sano di Pietro (1406-1481), Madonna and Child. Christmas stamp 1997. 1996. Paolo de Matteis (1662-1728), Madonna and Child. Christmas stamp 1996. 1995. Giotto, Madonna and Child (), National Gallery of Art. Christmas stamp 1995. 1994. Elisabeth Sirani (1638-1665), Madonna and Child. Christmas stamp 1994. 1993. Giovanni Battista Cima (1459-1518), Madonna and Child. Christmas stamp 1993. 1991. Antoniazzo Romano (1461-1508), Madonna and Child, Houston Museum. Christmas stamp 1991. Sandro Botticelli, Madonna and Child (c. 1470), National Gallery, 1988 Christmas stamp. Original painting. 1990. Antonello Da Messina (1430-1479), Madonna and Child, National Gallery of Art. Christmas stamp 1990. 1989. Carracci (1555-1619), Madonna and Child, National Gallery of Art. Christmas stamp 1989. 1988. 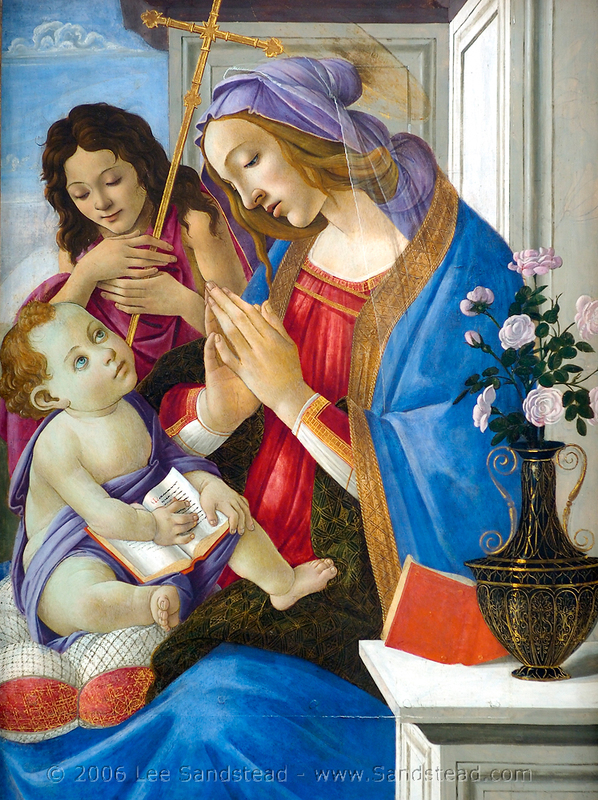 Botticelli (1446-1510), Madonna and Child (c. 1470), tempera on panel, 74.5 x 54.5 cm, National Gallery of Art. Christmas stamp 1983. 1987. Giovanni Battista Moroni (ca. 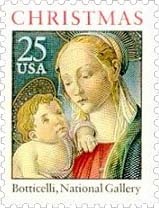 1522-1578), Madonna and Child, National Gallery of Art, Christmas stamp 1987. 1986. Pietro Vanucci Perugino, Madonna and Child, National Gallery of Art, Christmas stamp 1986. 1985. Luca della Robbia (1400-1482), Genoa Madonna enameled terra cotta, Detroit Institute of Arts, Christmas stamp 1985. 1984. Fra Filippo Lippi (1406-1469), Madonna and Child (1440-1445) Tempera on panel, 79,7 x 51,1 cm, National Gallery of Art. 1983. Raphaël (1483-1520), Virgin and Child, Naitonal Gallery of Art. Christmas stamp 1983. 1982. Tiepolo (1696-1770), Madonna and Child, National Gallery of Art. Christmas stamp 1982. 1981. Sandro Botticelli (1446-1510), Virgin and Child with Angel (Small Madonna) (1475-1485), Tempera on panel, Institute of Art, Chicago. Christmas stamp 1981. 1980. Walter Tower, Epiphany window (c. 1900), Stained glass window in the National Cathedral, Washington, Christmas stamp 1980. 1979. Gerard David (1460-1523), Virgin and Child, National Gallery of Art. Christmas stamp 1979. 1978. Andrea della Robbia (1435-1525), Madonna and Child with Cherubim, National Gallery, Christmas stamp1978. 1977. J.C. Leyendecker, George Washington Praying at Valley Forge, Christmas stamp 1977, which originally appeared on the cover of the Saturday Evening Post, Feb 23, 1935. This was also the subject of the 1928 2 cent stamp, captioned "In God We Trust." 1976. John Singleton Copley (1738-1815), "Nativity" (1776). Angel detail from Jan Van Eyck, "The Annunciation," 1968 Christmas stamp. Larger stamp image. Original. 1975. Domenico Ghirlandaio, "Madonna and Child" National Gallery. Christmas Stamp 1975. 1974 was the Dove of Peac weathervane atop Mount Vernon, home of George Washington, the first pressure sensitive adhestive stamp ever issued. 1973. Raphaël (1483-1520), Small Cowper Madonna (1505), National Gallery of Art. Christmas stamp 1973. 1972. Master of the St. Lucy Legend (unknown Flemish master), Detail of angel in "Mary, Queen of Heaven" (1480), National Gallery of Art. Angel. Christmas stamp 1972. 1971. Giorgione (1477-1510) Adoration of the Shepherds, National Gallery of Art. 1970. Lorenzo Lotto (1480-1556), The Nativity, National Gallery of Art. Christmas stamp 1970. The 1969 stamp was a Curier and Ives scene. 1968. Jan Van Eyck (c. 1390-1441), Angel Gabriel (detail) from "The Annunciation," National Gallery of Art. Christmas stamp 1968. The 1965 Christmas stamp had a more secular theme. In later years there was nearly always a clearly religious stamp, usually with the Madonna and Child. 1966, 1967. Memling, Madonna and Child (), National Gallery of Art. Christams stamp 1967 (taller commemorative size). Also another Memling 1966 (standard stamp size, cropped more at bottom). Prior to 1966, Christmas commemorative stamps didn't have a religious theme. 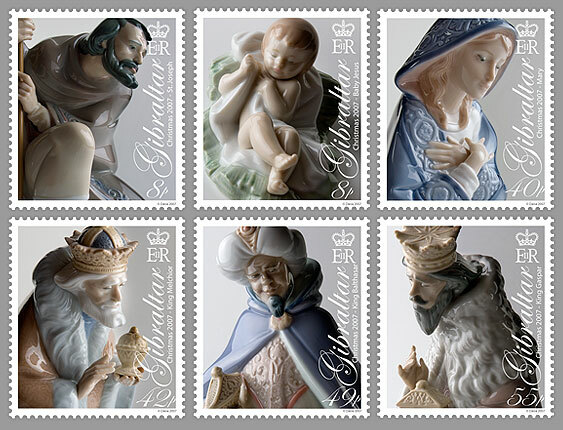 Gibraltar 2007 features beautiful photographs of six porcelain nativity figures. Collection of UK religious Christmas stamps at the Bible Stamp Club & Museum. 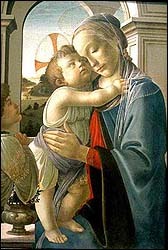 Madonna and Child paintings, catholic site.